UPDATE: Savasocket's energy-saving remote-controlled mains block | What Hi-Fi? We've had an update from Savasocket about the 6 Gang power-saving mains block. The first stock is arriving into the UK on April 15th and will be available from the Savasocket website. It will set you back £19.99 plus delivery £3.95. which sounds like just under £24 to us. 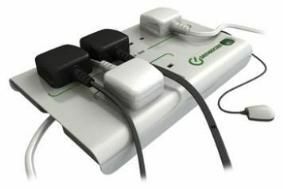 Using just under 0.19 watts of power in standby, it claims to be "probably the most efficient energy saving multiplug on the planet". It's a prickly one for the AV industry, where products are often best left on for peak performance, but if you're getting in to the habit of turning your kit off rather than leaving it in standby, here's a product for you. The Savasocket 6 Gang not only offers surge protection and a six-way mains block, it allows you to remotely turn off your AV kit. Four of the plugs are for kit you want to turn off completely, while the other two will stay on in standby mode so that products such as a Sky box or PVR can still function fully. The company claims it's "probably the most efficient energy saving multiplug adaptor on the planet", as it only uses 0.19 watts of power when in standby, well under the Energy Savings Trust's recomendation of 1 watt. This product has also received the Energy Savings Trust's "recommended product" award as well as an award for innovation. The Savasocket 6 Gang is programmed in under 30 seconds by the customer's remote control and claims to be easy as you like to programme. It's controlled by an infrared remote control that communicates via an 'infrared eye', complete with a 2m cable, that attaches to the mains unit. We're waiting for confirmation on pricing and availability.